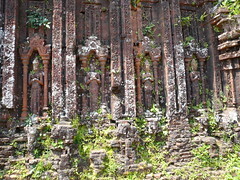 The Vietnamese government has sought the Archaeological Survey of India to help restore the My Son Sanctuary. The Vietnam government has sought assistance from the Archaeological Survey of India (ASI) to restore a portion of My Son Sanctuary, a world heritage site that has one of the largest collection of Hindu temples and monuments in Southeast Asia. “Yes, we have been approached by the Vietnamese government to undertake restoration works at the sanctuary which houses centuries-old temples, some dating as far back as the 4th century AD,” ASI”s Director General Gautum Sengupta told PTI. Set in a valley surrounded by high mountains, the 70-odd monuments in My Son Sanctuary”s precincts were badly damaged by US” week-long carpet bombing during the Vietnam war in 1969. The surrounding terrain is considered perilous even now because of another legacy of the war – undetected landmines.